bl.uk > Online Gallery Home	> Online exhibitions	> Asia, Pacific and Africa Collections	> Cashmere nautch girl. 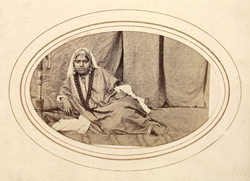 Full-length carte-de-visite portrait of a reclining Kashmiri nautch, or dancing girl, one of a series of prints of ethnic types and occupations taken by Bourne and Shepherd 1860s. In the 19th century photographers sought to document the diverse races, customs, costumes and occupations they encountered on the sub-continent. In Europe the rising interest in ethnology, together with a desire for exotic souvenirs of the east fuelled the demand for such prints.